Very compact and feature rich device, it feels like a quality built unit, very quick delivery by Tayna batteries. I'm a fan of this type already as this was to replace an M100 I'd had for 7 years but finally gave up the ghost - to be fair probably caused by me charging oversized battery banks resulting in prolonged max output usage. So this is a step up in size but the same great features and hopefully the same longevity. 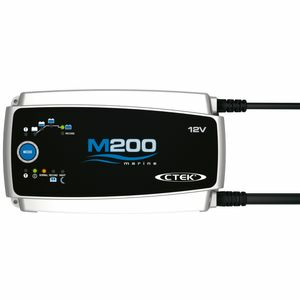 If you're swithering between the M100 and M200, first impressions are that the M200 is worth the extra cost - its a far beefier construction as well as higher output and has a temp sensor to vary the charging voltage as required. Tayna had the best price I could find for these and their service was excellent. I'll be back when I need to replace my batteries! A good quality charger, that does the job, recommended. Quality product at the best price I could find. Impressive bit of kit. Tops up 220ah batteries registering 12.3 V to 14v in 1 hour. Installed to use on genny power as our 300w solar panel isn't putting much in on these grey winter days. Only used in basic mode so far but seems excellent. What it does seems quite complicated and a bit daunting to a non electrical person but controls are simple enough. Solid, compact and seems very fit for purpose. Delivery service was very efficient. Although the website seems not too professional, the service behind is beyond everything. I faced some payment error issues, but the customer support team has done everything swiftly. I would like to open a separate bracket for shipping. This was the best cared shipping i have ever seen. Thanks for all. Tayna Batterie Served by Anne Taylor 5stars I own four CTEK battery charges. 5stars out of five. Would higly recomend Tayna Battery to deal with !! Charger not in stock, however Tayna located and supplied one within 5 days. Delivery was made in spite of snow bound road system and generally very poor weather. Price included "standard delivery" really outstanding service. Excellent product at excellent price. What more can one say? I now have a valuable new supplier of electrical equipment. Supurb battery Charger Use on my narrowboat when plugged into landline. Easy switch it on and forget charger Does what it says on the tin! Great little compact Charger that packs in a lot power. I have a 12v 200 ah battery with a small bilge pump attached so it can work 24/7, It keeps the battery topped up and maintains its level of charge at all times. I bought this for standby charging of the 250Ah battery in my Camper Van. Originally, I had a CTEK 8A Charger - but it didn't like charging such a big battery (kept showing an error). This however, works perfectly. It's much bigger than I expected - but very solid and well built. Excellent product for charging my starter and domestic batteries on houseboat. This is the charger recommended by most boaties.